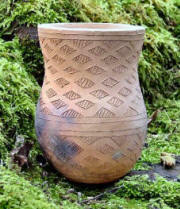 Clay has been worked by people since the time of our ancestors in pre-history. 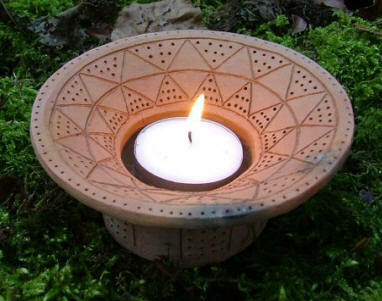 They used pottery items in both their everyday lives and for use in ritual. 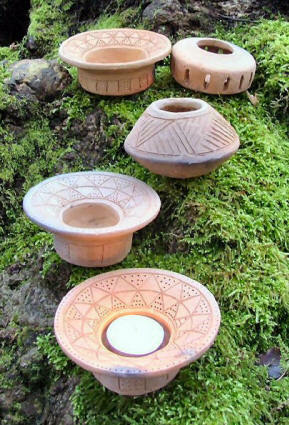 All our items have been crafted with hand-dug clay from ancient Wessex and created using the time-honoured techniques of the ancient people of the land. Each item is completely hand-made from start to finish and is fired in the traditional way. The Prehistoric-style pottery items featured on these pages are carefully copied replicas of archaeological finds in the ancient Wessex area of Britain. We offer a range of pottery from elaborate beakers to incense cups. The pottery shown below is all sold and is left simply as a portfolio of previous work. New pottery items may be crafted in the future and when new items are available they will be shown on our Facebook and Twitter pages. This is a copy of a Long-necked beaker found near Lockeridge in Wiltshire. It features a diamond design. A selection of replicas of the Aldbourne cup which dates from the Bronze Age and was discovered in Wessex. 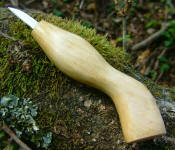 There are a total of three replicas for sale and each one will vary slightly as they are handmade. A selection of replica Grape cups which date from the Bronze Age and were discovered in Wessex. 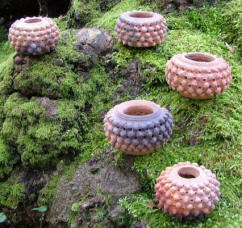 It is thought that they were used as incense cups. There are a total of five Grape cup replicas for sale and each one will vary slightly. The finished items sometimes have minor flaws, such as small hairline cracks, and colour mottling - this is perfectly normal and is due to the ancient techniques used in crafting. This is all part of the character of the item and doesn't effect the use in any way.